Alunocara Nyassae as is it scientifically known is freshwater fish that is also an aquarium favorite amongst a number of aquarist hobbyists. The fish is popularly known as the peacock cichlids in the hobby circles. The fish is not aggressive and can easily be reared in the same tank with other fish. The males of this fish species are known to be territorial and it is not uncommon to find one male living with several females in one tank! The fish is native to the East African nation of Malawi particularly Lake Malawi. This is a freshwater lake which is among the numerous lakes that are found within the Great Rift Valley of Africa. The lake is home to many other species of peacock cichlid species and experts estimate that over twenty of such species have been identified. Basically the male species of the peacock cichlid have some quite some differences from the females. The males of the fish usually show iridescent shades of bright colors. The males are quite interesting in that as they grow from young to maturity they keep changing their appearance. Adult males will show a variety of colors which may include; red, yellow, purple, blue, orange and golden color. 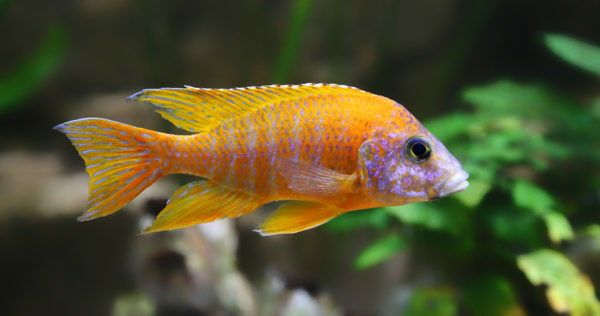 The female Peacock Cichlids are usually not brightly colored like the male but in general they also exude beautiful varieties of colors that is characteristic of their species. The females of the fish usually appear a little smaller than the males although this may not be true with every female fish out there. Many other cichlid fish species have a tendency to change their general appearance when they are breeding or due to their moods. The peacocks usually don’t change their appearance or color when breeding or due to mood change. There are varieties of peacock that exhibit varied colors so that you may mistake them to be totally different fish. It must be understood that the color of this fish species is usually determined to the part of the lake that it comes from. Due to the variety of colors that the same fish species exhibits, it makes a perfect addition for display aquarium. The Peacock cichlid is a freshwater fish that is native to Lake Malawi situated in two East African nations of Malawi and Tanzania. This lake is a freshwater lake that is a perfect habitat for the fish. The lake’s water is known to be fairly warm owing to the tropical nature of the region where it is situated. The fish likes to inhabit the lower parts of the lake where it spends most of its time swimming looking for what to feed on. The fish feeds on small insects and invertebrates that it finds at the bottom levels of the lake. The lower level of this lake is sandy and thus a haven for invertebrates that the fish continually hunt to eat. It must be noted that the fish is a highly active swimmer. Peacock Cichlids are active hunters and swimmers who in the wild like to hunt vigorously for their food in the bottom levels of the lake it therefore imperative to provide ample space. A large tank is ideally perfect for this fish when you are keeping them in captivity. The minimum requirement tank capacity for the fish should be at least 100 gallons but even a larger one for more fish. The water pH that is ideal to keep the fish should range between 7.8 and 8.6 because these are almost similar to those of its native habitat of Lake Malawi. When you see pH levels have changed too much better change the tank water. Any fish that is kept in captivity should have regular water changes due to the waste products they produce every day. Allowing the waste and food particles to collect in the same water for quite too long can be lethal to the fish. Perform weekly water changes even if it three quarters of the tank water. The fish lives in fairly soft water and the hardness should be regulated to between dH4 and dH6. In order to make the aquarium appear for the fish as natural as possible use rocks and sand substrate at the bottom of the tank. Remember in the wild the fish dwells in the bottom level where there is sand and rocks for hiding. 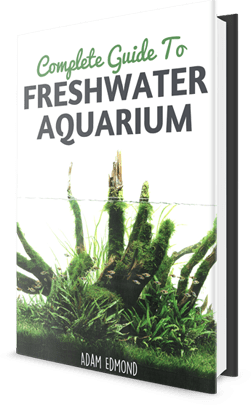 You can decorate your aquarium with live aquatic plants without worrying about the fish eating them. In fact the plant will provide the fish a perfect hiding spot when they feel threatened and thus need to hide. The temperature range of the tank should be regulated to between 76° and 82°C. Moderate lighting is just perfect for this fish if you are keeping them in an indoor aquarium. Offer them food that will sink to the bottom of the tank where there is substrate. Remember they are bottom dwellers in the wild preferring to hunt for food in the lower levels of the lake. You can offer them insects because they feed on meat but ensure the food can sink to the bottom. You can offer them frozen or fresh food too. The Peacock Cichlids are quite easy to breed. When it is time for breeding all you may have to do is to place a male female in a separate tank. The female fish will lay several eggs which will be fertilized with the male during spawning. It is the female that will care for the fertilized eggs until they get hatched. She may continue providing care to the fry for some more days and later leave them to look after themselves.